The library as a space is a complex idea. It serves as a learning space, a research space, a social space, an innovative space, and a flexible space (Chan & Spodick, 2014) — especially in a school context, where the library is viewed as a place to extend the curriculum. In addition, the teacher librarians who have redefined their libraries in recent years to remain relevant to their clientele can testify to the importance of creating a cultural space as well. This is not a new idea; concerts have been held in the Library of Congress since 1925 (Brown 2014, p. 391). To ensure my senior school student clientele did not completely miss the benefits of enjoying the library as a fun place to be, I pulled the idea of themes from my 28-year experience as a primary teacher. I sought meaningful ways to link ideas together and to provide a structure to organise displays and activities in the library. I trialled this in 2016 with some success. In collaboration with our library staff and teacher librarians in the OZTL_NET community, we decided on four themes — one per term. This theme was a great way to start the year. We placed a display in front of the library, which included ways to connect in the library: with staff, with information, with each other. We encouraged students to contribute to a large paper chain art installation which dangled from the railings of the mezzanine floor. At times, the senior school can be disjointed — in different subjects, different sporting groups, different cultural and music groups — so we publicised it to the community as a way to illustrate how we all connect together. Students were keen contributors with home group classes and other groups participating. Some students made an art form in the way the paper chains were connected. It was a fulfilling community bonding project. To coincide with the theme ‘Connect’, staff and students contributed to the paper chains, illustrating how everyone is connected. I purchased a large outline jigsaw puzzle, allowing students to put it together and then colour the pieces. This also proved to be a special device for bringing students and staff together from different year levels, who contributed piece by piece to the puzzle over a period of several weeks. The Create Gallery showcased original works by staff members in the school. 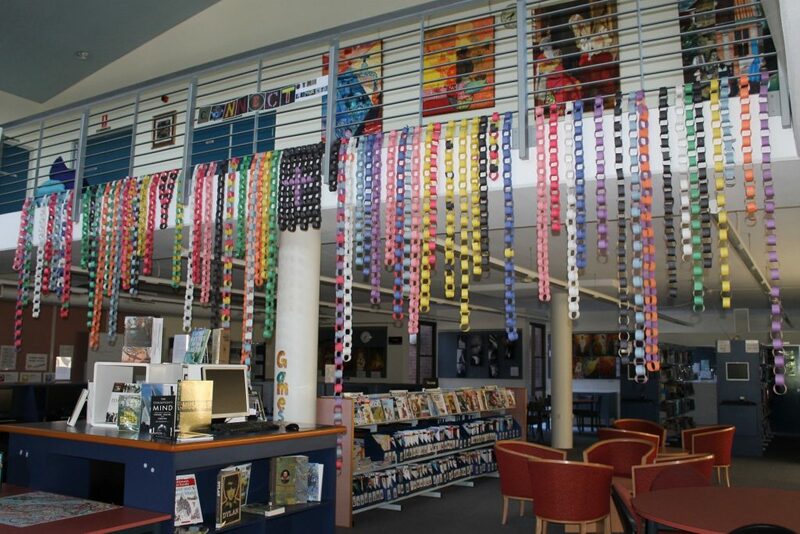 The ongoing art installation of paper chains gave an inspiring backdrop to hold a ‘Create Gallery’ in the library in Term 2. 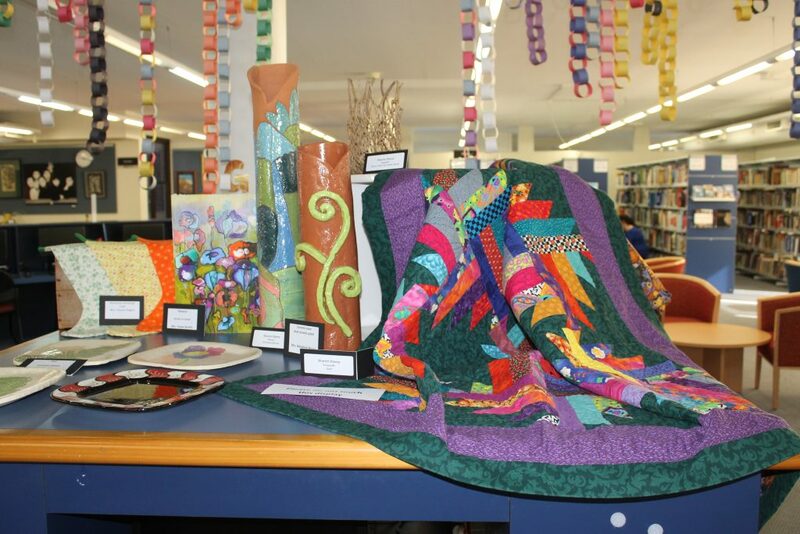 We invited all staff — both academic and support — to contribute items they created, from craft to paintings. We set up the display like an art gallery, with information regarding each piece. It was a wonderful way to demonstrate lifelong learning to students: that learning does not cease when school finishes. It also showed that talent can come from surprising sources, such as the teacher who no one knew painted, or the cleaning staff who knitted unique jumpers. A maker station was placed to allow an opportunity for students to create corner bookmarks. We provided raw materials with some display examples. Students were very creative in their designs and often left them for others to emulate as examples, thereby ensuring the learning was passed on. This theme became a great anchor for the Children’s Book Council of Australia Book Week activities during the term. A library staff member teased out the Australia: Story Country idea and put together a ‘Fiction race around Australia’ to coincide with the 2016 theme. We have a great multimedia space in the library and used this for Movie Weeks twice during the term, showing the movie on the big screen coupled with a display about the book series or author. In addition to all this, we held a Publisher’s Display Day where we invited publisher representatives and book suppliers to set up in the library for the day. Both staff and students were then allowed to select resources from the displays to add to the collection. It was a great way for teachers to see what new resources were available and for students to have a greater say in the fiction book selection. This was a profitable partnership for all parties. We had the best intention to utilise ideas that built on STEM concepts, such as competitions like The Marshmallow Tower Challenge and a Lego competition. We also intended to focus on group activities. A combination of a shorter term, heavy assessment time, and a total refurbishment of the main floor of the library stymied our efforts and we literally ran out of time. When critically evaluating our efforts with themes in 2016, I considered using different theme titles moving into 2017, and again sought ideas and advice from teacher librarian network OZTL_NET. I had many responses for ideas, but in the end, we decided as a staff to keep the same four themes in 2017 to consolidate our efforts and expand the ideas. This was only our first year and we will only improve and grow our efforts over time. These ideas would not have been possible except for the contributions from many experienced teacher librarians who willingly shared their thoughts and ideas. Idea sharing is invaluable for both the new teacher librarian, such as myself, and the experienced teacher librarian, who is interested in trying new things. Just like the concerts held in the Library of Congress, the concept of themes is not new, either. Many teacher librarians have been using such ideas, particularly in primary libraries, for a while. It is important to recognise that as we establish cultural space in our libraries, we can gather ideas from many other sources and create a new approach to an old idea, putting it into practice in our own unique situations. Try something new, even if you don’t think it will succeed. The response from the clientele can be surprising. 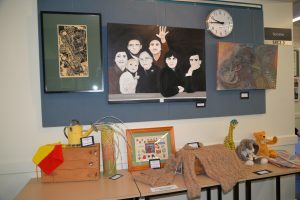 The Create Gallery helped students see that lifelong learning does not end after school. Brown, CM 2014, ‘Concerts and dances in a library? An undergraduate library as campus cultural space’, College & Research Libraries News, vol. 75, no. 7, pp. 387-391. Chan, DLH & Spodick, E 2014, ‘Space development’, New Library World, vol. 115, no. 5, pp. 250-262. Do you have any ideas for themes in school libraries? We'd love to hear about them in the comment section below. You can also contact Angie at amorris@redeemer.com.au. These are fabulous ideas. Well thought out and meaningful for your students. Some look like projects that the teachers have embraced and had a chance to share their ‘out of the classroom’ talents. Keep it up! Look forward to hearing more ideas. I loved visiting your library and took away so many ideas. I even put my own spin on your ‘create’ display that I saw during my visit. Such visits of professional networking are invaluable. Thank you for so generously sharing with me. I think it is wonderful to connect and share ideas as librarians. The digital display idea is a keeper! I’m going to ‘steal’ and adapt this one as well.